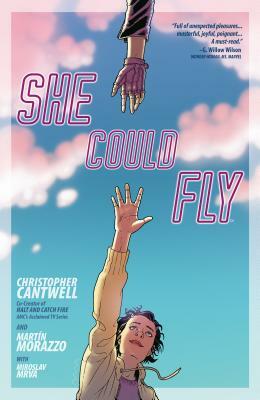 In this graphic novel from the co-creator/showrunner of AMC's acclaimed show Halt and Catch Fire, a disturbed 15-year-old girl obsessively searches for the truth behind a mysterious flying woman who explodes in the sky one day. Over the course of 51 days in Chicago, an unknown woman appears publicly 11 times, flying at speeds of 120 miles per hour and at heights reaching 2,000 feet. Then she suddenly dies in a fiery explosion mid-air. No one knows who she was, how she flew, or why. A disturbed 15-year-old girl named Luna becomes obsessed with learning everything about her, even as rumors and conspiracy theories roil. As Luna comes closer to the truth--all while defense contractors, government investigators, and foreign sources creep around the fringes--she hopes that cracking the secrets of the Flying Woman's inner life will somehow lead to liberation from her own troubled mind.